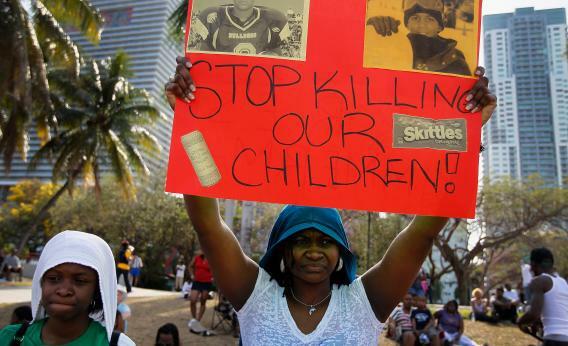 Supporters of Trayvon Martin gather in Miami, Florida. It was just a matter of time before white supremacist groups and right-wing apologists for abusive police started coming out of the woodwork to try and justify the shooting death of Trayvon Martin. His emails and Facebook accounts have been reportedly hacked by the hate groups. His school suspension records were leaked and posted on the Web. All of this to show that Trayvon was not some angel but, to some minds, a stereotypical young black thug who deserved what he got. This type of racist mindset overlooks the fact that even if Trayvon was an extremely troubled kid from an extremely troubled background – much of the reporting on him and his family so far says otherwise – none of it would justify his shooting. He was unarmed. He was stalked, cornered, and killed. He violated no laws walking on the street and in that gated community. He had friends and family who loved him. One of his teachers described him as “an A and B student who majored in cheerfulness.” He was a child and he deserved the chance to live out his future. Period. He was suspicious solely because he was black. As Bryan pointed out, that’s something that black parents, and for that matter the sisters, aunts, cousins, girlfriends of black men and boys, understand all too well. We worry because we know they are potential targets of police and armed civilians, guided by long-held racial fear and ingrained assumptions about black males. Although Trayvon’s death is introducing a new generation to this sad reality of “Living While Black,” those of us who’ve been around longer know what black men endure on regular basis and why they are taught a code of conduct at an early age. The New York Times wrote about this back in 1997. And yet it keeps happening. “They killed my son and now they’re trying to kill his reputation,” Sybrina Fulton, mother of Trayvon Martin, said last week in response to the information leaked about her son. She and Trayvon’s father blame the Sanford police department for the leaks about Trayvon’s school suspensions – once allegedly for suspicion of possessing marijuana – and his supposed unprovoked attack on George Zimmerman. Zimmerman’s father is waging his own PR campaign on behalf of his son. He started out by claiming that his son, whose mother is Peruvian, considers himself Hispanic, as if his biracial status undermines arguments that his son may have acted out of racial bias. It’s convenient to point out that Zimmerman is part Hispanic right after he shot dead an unarmed black kid. Never mind that George Zimmerman called police obsessively about “suspicious ” black men in his neighborhood and may have even used a racial epithet in his 911 call about Trayvon. Hispanic people, like white, black, Asian, Native-American and, yes even bi-racial people, are perfectly capable of being racist or showing racial bias in certain instances. Black males just seem to get the brunt of that bias and too often end up dead because of it. Last week, Zimmerman’s lawyer trotted out Joe Oliver, the “black friend” and former co-worker of George Zimmerman, who did the rounds on television talk shows and news programs and defended Zimmerman. Unfortunately for Zimmerman, Oliver did him no favors, as this video clip shows. Oliver didn’t seem to know Zimmerman very well and didn’t know that Zimmerman’s ex-fiancee had filed assault charges against him. He stumbled on questions about the anger management counseling Zimmerman allegedly underwent. The “some of my best friends are black” tactic failed badly. Zimmerman’s father reminds me of the father of one of the NYC cops who tortured and sodomized Abner Louima with a broomstick in a Brooklyn police station in 1997. The cop’s father presented his son’s black girlfriend as if her mere existence could discount the fact that his son sodomized Louima while hurling racial epithets at him. Racism is complex and often deeply internalized; socializing casually with an individual black co-worker or sleeping with a black woman doesn’t change that. I’m waiting for Zimmerman’s real black friends, those who knew him well and know his heart, to come forward and vigorously defend him. I’m not holding my breath.